How About a Little Chrome Polish? Chrome is my favorite web browser, by a long shot. For ease of use, features, security and extensibility, it gets my vote over Internet Explorer, Microsoft Edge, Firefox, Opera, and the also-rans. But there are some things that I (and perhaps you also) find puzzling and/or annoying. Let's look at those, and pick up some tips and tricks to make Chrome even better. A HISTORY LESSON -- My first annoyance is that Chrome does not warn you when you are about to close the browser with multiple tabs open, unlike every other browser. If you don’t want to lose all those open tabs, open Chrome’s Settings and under “On Startup…” check the radio button next to “continue where you left off.” All of your tabs will re-open the next time you launch Chrome. Note that if you had many tabs open, it may take a minute or two for Chrome to download all of the pages and display them. Another way to recover all of your tabs lies under the History option of the “three dots” icon’s dropdown menu. Hover your cursor over the word “History” and another submenu opens. One of the items on the menu will be “5 tabs” or whatever number of tabs you had open the last time you closed Chrome. Click on that item and all of the tabs will be opened. Oh, and here's a life-saver for me. When you click that little red X on a tab, Chrome will dutifully close the tab without asking "Are You Sure?" to confirm. But what if you accidentally close the wrong tab? Also on that History menu, you'll find a list of recently closed tabs. You can click any one of them to re-open just that tab. Even quicker, just press Ctrl-Shift-T and the most recently closed tab will reappear. Chrome remembers exactly where you left off, even if you were logged in to a website. JUST SAY NO -- Chrome asks your permission before allowing any site to learn your location or show you popup notifications. That’s nice, but if you always say “no” to such popup inquiries, you may as well make “no” the default setting. To do so, click on the 3-dots icon, then Settings, then Show Advanced Settings at the bottom of the Settings page. Now click the Content Settings button in the Privacy section. On the resulting page, select “Do not allow any site to show notifications option” and “Do not allow any site to track your physical location.” You won’t have to answer questions about those things again. Some sites will not function properly if they can’t know your location. If that’s a problem, you can always create an exception to the “do not allow rule” for a given site via the “Manage exceptions” button in the Location section of the Content Settings page. KEEPING CURRENT -- It’s important to keep your Chrome extensions up to date, but Chrome does not provide an obvious way to update all extensions at once. The secret is the “Developer Mode” button on the Extensions page. To get to that page, click on the 3-dots icon, then “More Tools, and finally “Extensions. Check the box next to “Developer Mode” and you will see the hidden “Update Extensions Now” button. Clicking on it will check for updates and install any found. LET'S (NOT) GO TO THE MOVIES -- Auto-playing videos are the bane of the Web. Chrome does not have a “block auto-playing content” option, but you can block auto-playing videos permanently with a bit of work. First, go to Settings > Show advanced settings > Content settings… (in the Privacy section). In the Flash section of Content Settings, select “Block sites from running Flash.” Now Flash videos won’t automatically play; you will have to give explicit permission to run Flash by clicking on the “run this plugin” option that appears in lieu of the Flash video. However, an increasing number of sites are switching to HTML5 for video presentations. To prevent auto-play of HTML5 videos, install the Disable HTML5 Autoplay extension. Now the HTML5 content won’t play until you click the big “Play” icon that this extension displays. THANKS FOR THE MEMORY -- If you open lots of tabs, you may run into a situation where Chrome complains that your computer is low on memory. One handy solution to this problem is a Chrome Extension called The Great Suspender. After installing this extension, tabs that are left untouched for a period of time will be suspended, freeing up memory for Chrome to devote to other tabs. Just click once to un-suspend a tab that's been suspended. CLEANUP IN AISLE 56 -- If you tinker with Chrome’s settings or add lots of extensions, you may run into performance problems. Then it’s time to run the free Chrome Cleanup Tool. It will scan your Chrome installation for programs that may be causing problems and offer to delete them. It wraps up by offering to reset your Chrome installation to default settings: no extensions will be retained, but your bookmarks and history will be kept. Speaking of extensions, I use Roboform to manage my passwords. But recently, I often find that Chrome has disabled Roboform, and I have to click Settings -> More Tools -> Extensions to re-enable it. That happens several times day, and that's annoying. I haven't yet figured out why, or how to fix this. Anyone else having this problem? Most recent comments on "[HOWTO] Fix Chrome Annoyances"
Jim, here's your fix for Chrome desktop shortcuts. Click the RELAUNCH NOW button at the bottom. Chrome will restart. I've been using Roboromf & Chrome for years & usually don't encounter problem but one thing I have noticed recently is that the little pop-up box that used to appear in the top right corner of a web page now no longer does so. Not a major problem because I can still just log in by clicking the main Roboform button at the top in the row of extensions. Having used Chrome for at least one year as my "backup browser", I cannot say I dislike Chrome, but find its sparse menus require frequent use to become familiar. For years, my default browser has been Firefox, whose menu system is fairly logically arranged, and menu items are-- by option-- either on display or hidden. Recently, to resolve a Chrome issue, I had to venture deeply into "Advanced" features to find the relevant control, and turn it off or on. This is what I mean by "sparse" menus-- ordinary features are buried deeply for no particular reason, all because Chrome wants to maintain a clean, bare look. I use LastPass with Chrome and have never had a problem. I haven't tried Roboform. I know Chrome will now turn off extensions that either didn't come from the Chrome Web Store, or that were installed without your permission. I was having the same problem with LastPass, so I switched to Vivaldi, which seems to be much more forgiving. An updated LastPass still won't run on Chrome, but runs perfectly on Vivaldi. I used RoboForm at one time, had a lifetime membership. But when I first started using Chrome RoboForm would not work with it. I tried LastPass until they had the data breach. I switched to Dashlane, which I still use. I love it and on the couple of times I have had problems, their support team has been outstanding. I would highly recommend Dashlane to anyone looking for a password manager. I am having issues with Flash Player crashing in Chrome while playing on-line games. CHROME is the recommended browser. Is there a way to correct or fix this issue ??? I can say that the more TABS I have the more frequent the crash. When I click RELOAD it only reloads the current TAB. I have to clear the CACHE to reload all the tabs. Loading just one TAB at a time is best, but a pain. Does CHROME have a setting to stop or delay this from happening ? Re 'Keeping Current' info. There are no 3 dots anymore - my Chrome has changed this to an up arrow. When the "three dots" changes to an "up arrow" that means there is a Chrome update available. The three dots are on the far right in the latest version of Chrome. The "up" arrow on the left is actually a house which brings you back to your Homepage. I have had no issues with Roboform, and am now using version 8. My pet peeve is that there is no key combination that flips between two open tabs, useful when comparing two items on separate pages for example. I use Blur from Abine. For some reason, Chrome often does not keep my passwords. Also, the free version of Blur does let you use masked email and has a password keeper. I use the paid version as it also blocks trackers, beacons of "light"-right! Tracking drives me nuttier than normal and that is saying something! 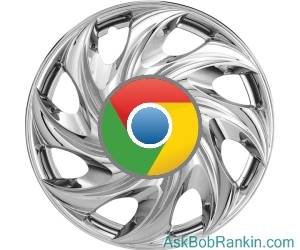 However, I still think Chrome is the best and thank,Bob, for your once again, great article of advice. How can the most widely used browser (by a wide margin, he says) have so many 'annoyances'? I was a Firefox user and still am, but when I started using Chrome (had to for certain applications, like uploading pics to ebay which FF won't do anymore) I realized it is exactly like Firefox (OK not exactly, but practically speaking, the same). All googul did was hide the toolbar and switch around all commands (same commands as firefox has) and put some commands as subheadings under others. Big deal. They did a switcharoo. I still don't see what's so great about Khrome, over Firefox. Is there a way to find out which extensions are no longer being updated or supported? Thanks for the tip to select 'Developer Mode' for upating. I'm also trying the 'Great Suspender' now. I tried 'OneTab' which simultaneously closes and saves all open tabs, but it's essentially just a lazy way to bookmark. You have to remember to go to it to reopen tabs instead of them being there waiting for you. I switched from Roboform about 6 yrs ago to LastPass which has always worked fine in Chrome for me. Use it on my iPad too. Instead of the default new tab I prefer 'Start - A Better New Tab' which is very customizable. Google Chrome doesn't only want to be a reasonably safe browser, it also wants to teach us how we SHOULD organize our work. Basic things are missing, options can't be set off (you have to rely on extensions), privacy has been violated, and more. Google's (young) employees think that they have an absolute monopoly on wisdom. Even worse, they don't want to listen to and learn from Google's users. Bigger arrogance is hard to imagine. is analyzing these things, so I am going to inform her." There's more reader feedback... See all 44 comments for this article.